I want to start with ‘I’m really getting back into this blogging thing’ but I know as soon as I write that, I’ll not blog for weeks, months or years! But I am enjoying it again. Blogging is a fantastic distraction for me, when I get home from work, if I switch my laptop on the first place I will usually go is to my work e-mails and see what I’ve missed in the 45 minutes I’ve been on the tube (sad I know), but being back on the blog means that of course I keep checking the e-mails – I can’t help myself – but I get on with attempting to write enjoyable prose for anyone who should so wish to read the waffle that I type from time to time. As you can probably tell – I spent all my dosh on posh meals out so am now doing a lot more cooking at home. I shouldn’t really class this as a recipe as it’s seriously easy but in case anyone saw my Instagram pic last weekend and wondered how to make it. Put the pasta into salted boiling water and leave to cook for about 8 minutes. While the pasta is cooking finely chop the shallot, chilli and parsley. I left the seeds in the chilli, it wasn’t a small one so didn’t blast any heads off. Heat a little oil in a non stick frying pan and chuck in the onions to soften on a medium heat. Add the chilli and crab meat and turn the heat down a bit. The crab is already cooked you just want to heat it through. Drain the pasta once it’s cooked and tip it back into the saucepan. 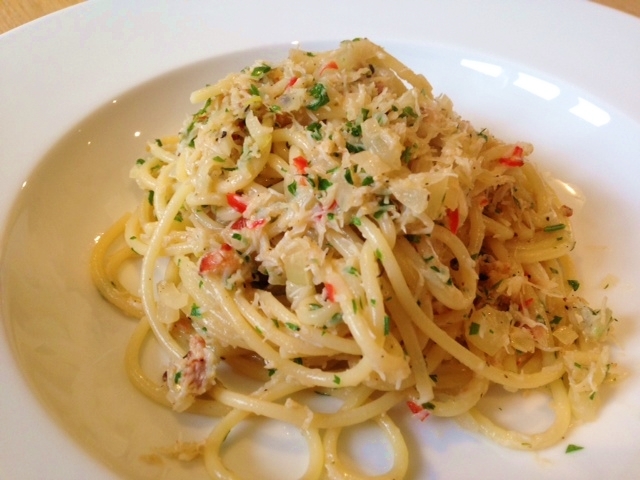 Add the crab, shallot and chilli mixture and parsley to the pasta, stir through so the crab meat is evenly distributed and serve with a good slug of really good olive oil.